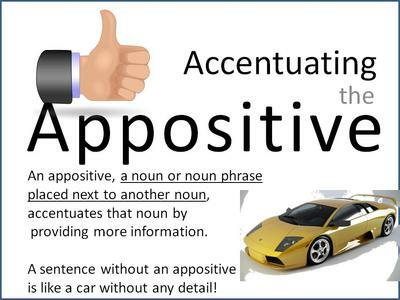 We teach the appositive extensively in our writing and language arts books because it is an amazing conciseness technique–and it shows a student’s skill in handling difficult grammar concepts and punctuation challenges. Plus, it truly does help a student write more concisely! 1. Is a phrase that restates something else. 2. Is usually used to restate (or elaborate on) the subject (though it can be used to restate anything really. 4. Can be used to combine two sentences into one in short, choppy sentences. Donna writes language arts and composition books every day. Donna has written over fifty curriculum texts. Donna, WHO HAS WRITTEN OVER FIFTY CURRICULUM TEXTS, writes language arts and composition books every day. Did you know that last week’s PUNCTUATION PUZZLE had an appositive in it? I had barely noticed her mood, HER TEMPERAMENT, when she suddenly blew up, and she began shouting and throwing things at me, which was something I was not accustomed to seeing. 1. Her temperament renames the noun mood. 2. It is set off with commas surrounding it (her temperament). 3. It (along with the commas) can be removed from the sentence, and a complete sentence remains.